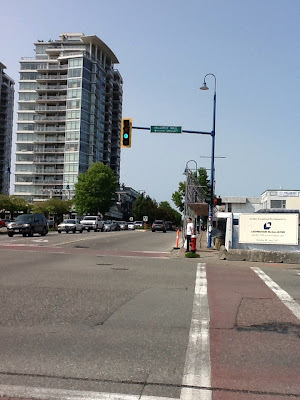 A few weeks ago, I was in White Rock and decided to walk around the Uptown area. One of the first things I noticed was that the buildings and public realm are getting long in the tooth. Many of the buildings are from the mid-20th century and are past their best before date. 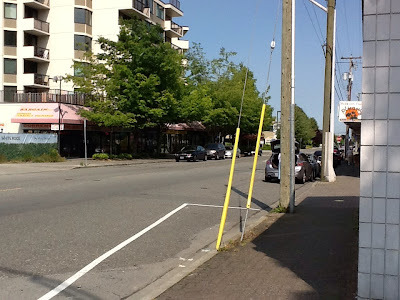 White Rock’s Uptown public realm includes early 90’s Teal/Blue street lamps and furnishing, narrow red interlock paver sidewalks which are an accessibility nightmare and tripping hazard, and utility poles in the sidewalk. Even the intersections are looking worse for wear. White Rock's Uptown with dated streetscape. This intersection in White Rock is worse-for-wear. Uptown White Rock actually reminds me of Downtown Langley which suffers from the same issues. This is no surprise considering that White Rock and Langley City are both smaller municipalities with a limited tax base. In White Rock and Langley City, the municipal government is banking on new development to enhance the public realm and both communities even have good examples of new projects that are improving the public realm. New development with updated public realm on left, worn-out public realm on right. 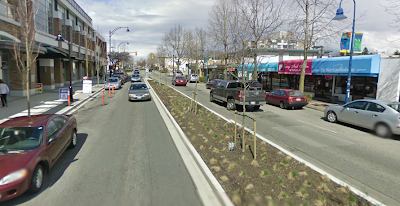 The challenge is that while communities like Surrey and the Township of Langley can count on developers to build the public realm quickly due to their rapid rate of growth, White Rock and the City of Langley are older, slow growing areas. As it will likely take 25+ years to redevelop the traditional commercial hubs, both communities will suffer from a piecemeal public space that will only get worse. One of the solutions to this problem is for local government to partner with local business improvement associations to setup Local Area Service districts. These districts would allow the cities to update their traditional cores and pass on some of the cost to businesses that directly benefit. The public realm in the City of Langley and White Rock is already in need of replacement and waiting 25+ years for redevelopment is not an option. In order to create vibrant, pedestrian friendly communities, we need a well designed public realm.